Hello Lovelies!! It's the weekend and I am glad for it! So yes I am back and boy do I have something fun for you! What is it you ask? Well a fun DIY of course! Yes I am all about doing things yourself, especially crafts. A while back I posted this simple do-it-yourselfer on Instagram. I was so happy to have a great way to display some of my favorite necklaces, but let's be honest, it's starting to look a little blah. The time has come to spruce it up. 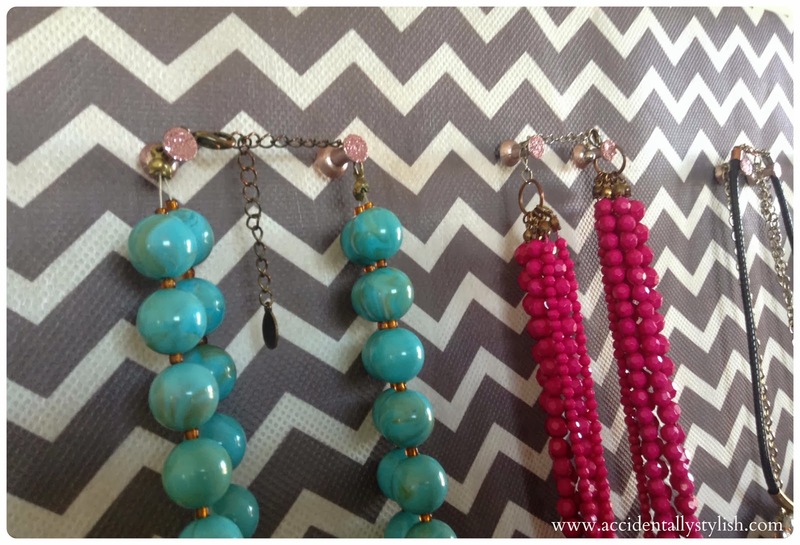 So here is my little DIY to step up--and possibly simplify--your jewelry displaying game. Okay, so I know what you're probably thinking right now. What's the nail polish for? Well you see those vibrant colored push pins over there? Um....yeah, not the look I'm going for with my fabric. Speaking of fabric, isn't it cute? I found this lovely print at my local Joann Fabric store on sale for $1.99 per yard. I only purchased one yard, but at $1.99 for the chevron look I definitely could have bought more. Maybe I could add the chevron look on more things in my home....Hmmmm, that gives me another idea. I'll just have to put that one away for later. One tip when shopping for fabric is to hit the store up during a sale. Even the clearance section is a great way to find some fun fabric at a fraction of the cost. Remember to bring along some coupons too! Alright back to my bright push pin situation. While rummaging through my nail polish collection, I knew I wanted a color that was a bit neutral but still had a little pop. So I went with a copper/pink metallic glitter. This "Disco Lights" polish by Milani was a great way to add some sparkle to the pins, but I knew I needed a solid base under it. Can't have any of the original pin color peeking through, that's not cute. After a little more rummaging I came across this metallic beauty I received in a BirchBox swag bag from a prior bloggers conference. 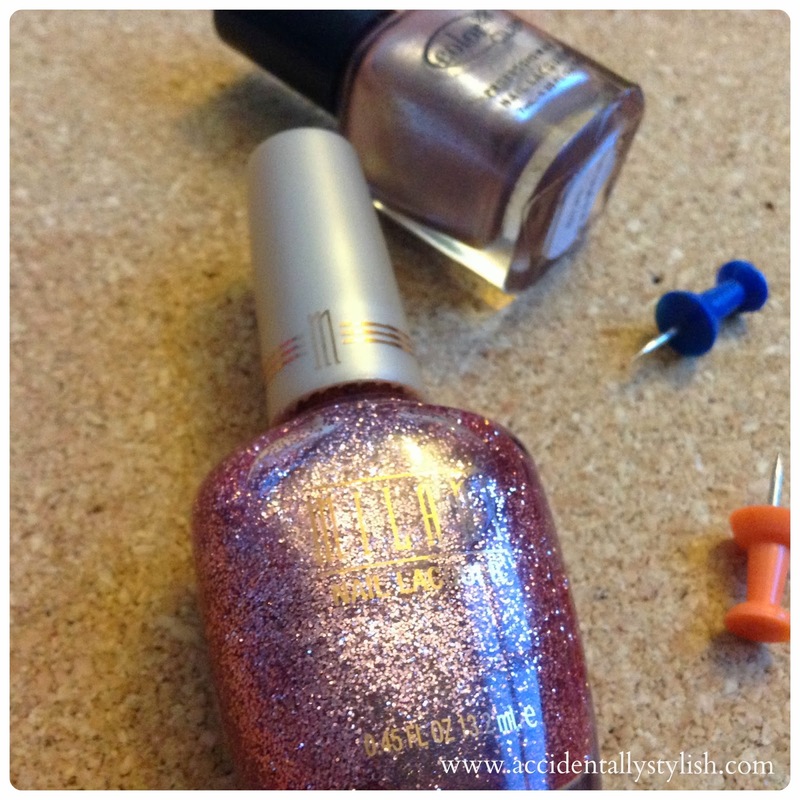 The pink/brown/silver combo of the Color Club polish was a perfect match to the sparkly Milani. I'll have to paint my nails to show you just how pretty it is. Even then the camera just doesn't do it justice. Just trust me when I say it's gorgeous, GORGEOUS!! 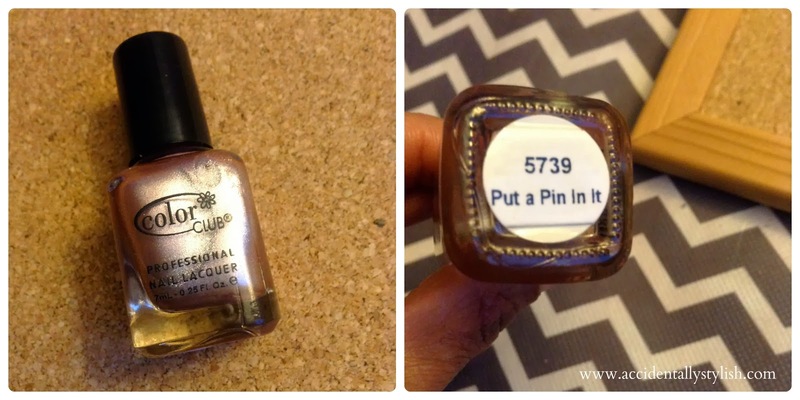 I didn't realize it at first, but the Color Club polish is named "Put a Pin In It". How ironic, I guess it was meant to be for this project. 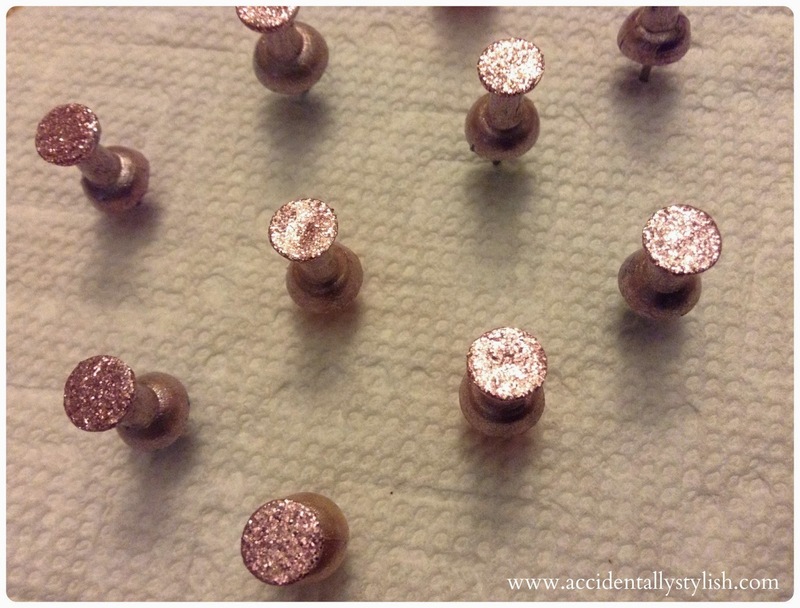 :) All right, now that you have your nail polish selections it's time to paint your pins. 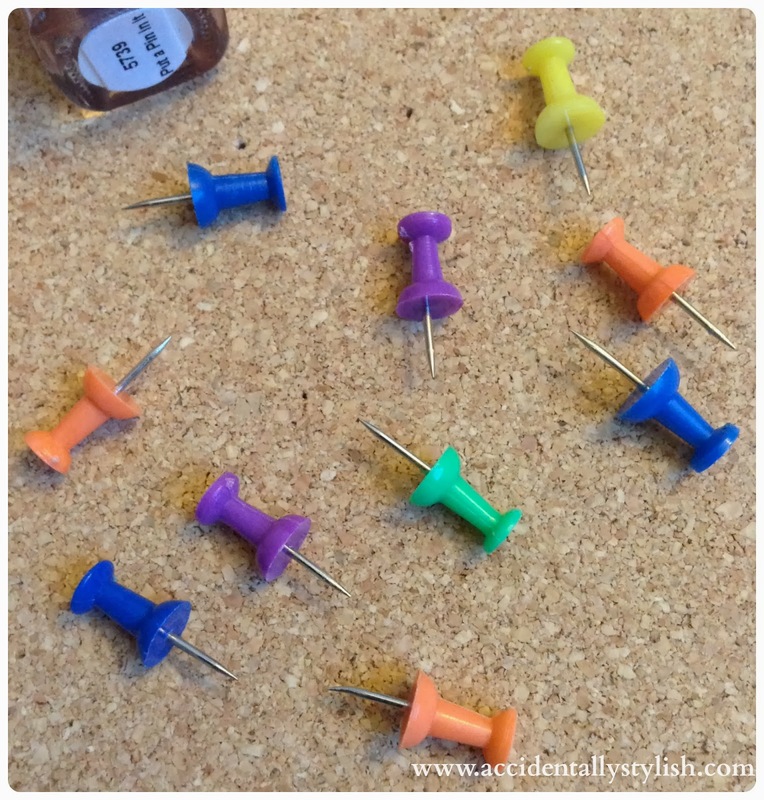 It was easier for me to stick the painted pins into the cork board lined with a paper towel to dry. You want to keep them upright as to not smear the polish. Do overs are such a drag if you know what I mean. Below you can see just what a difference a few coats of polish can make to ordinary pins. After painting the entire pin with the Color Club polish, I decided to just paint the top of the pin with the glitter Milani polish. You could overlay the entire pin with the glitter sparkle if you'd like, but I wanted to be able to see the base color too. Depending on the density of the base polish you may need to add a few coats. Same goes for the glitter one. Now that our pins are dry, it's time to pull out that staple gun and your fun fabric of choice. My husband looked at me like I was crazy when I reached for the staple gun in his tool box. Sure I could buy my own, but for now his will do. Sharing is caring right? You can buy one at your local Joann Fabric, Michael's, or Walmart in the Home Decor section. They have all kinds of varieties depending on your project. Just search around and find one that works for you and your budget. I'm hoping to find one in pink, but for now his will do. Taking your fabric, place the side you want displayed down so the back is facing you. Next, place the cork board on top of the fabric. 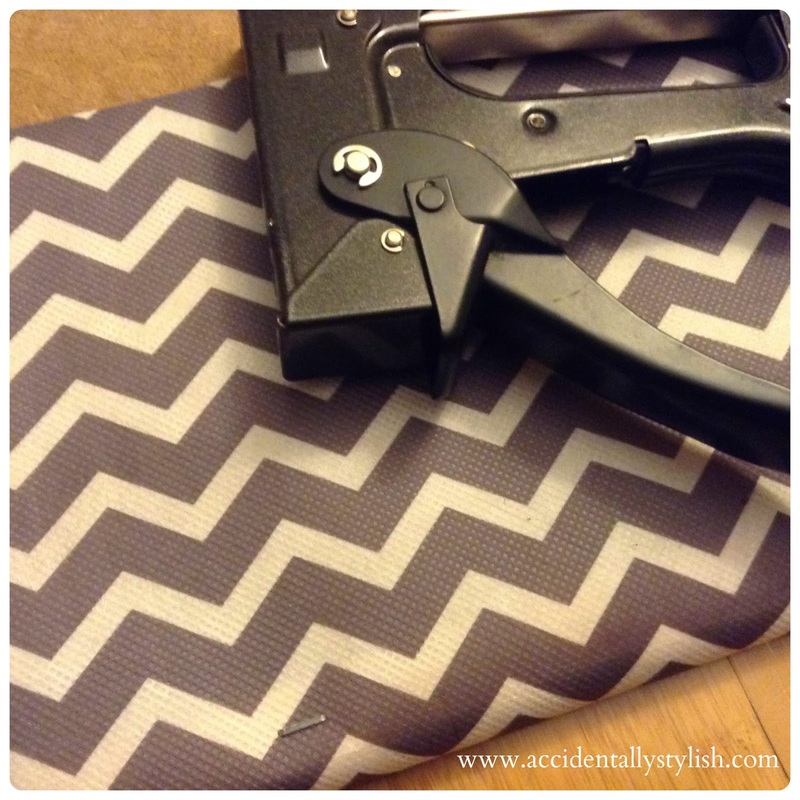 Depending on the size of the board you are using, you may need to cut the fabric down to size before stapling. 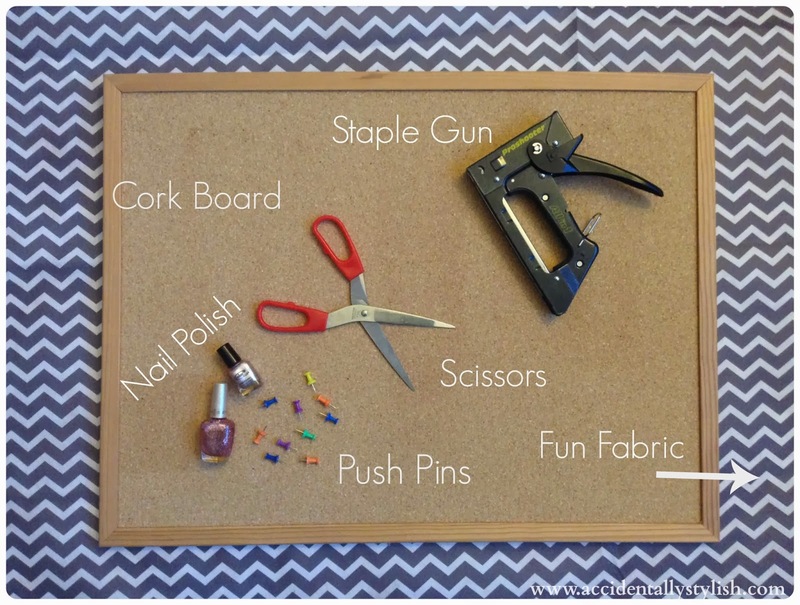 Make sure to staple the fabric onto the wood frame of the cork board and not directly into the cork. You want to ensure the fabric and staple have a good hold on the board. Also when stapling the fabric down, pull the fabric slightly as you go around. By pulling it around the frame and then stapling it down, you will get a smooth finish in the front, preventing the sagging print look. Once you have the fabric stapled all around the frame, cut off any remaining fabric around the back to relieve bulk. If you have any staples that were just too stubborn to lay flat in the frame, just smooth them out with a hammer. That'll teach those staples who's boss!! Now that your board is covered and your pins are primed, it's time for the final and most rewarding step. Hanging up your favorite jewelry pieces. TA-DA!!! What do you think? I love the way it came out!! 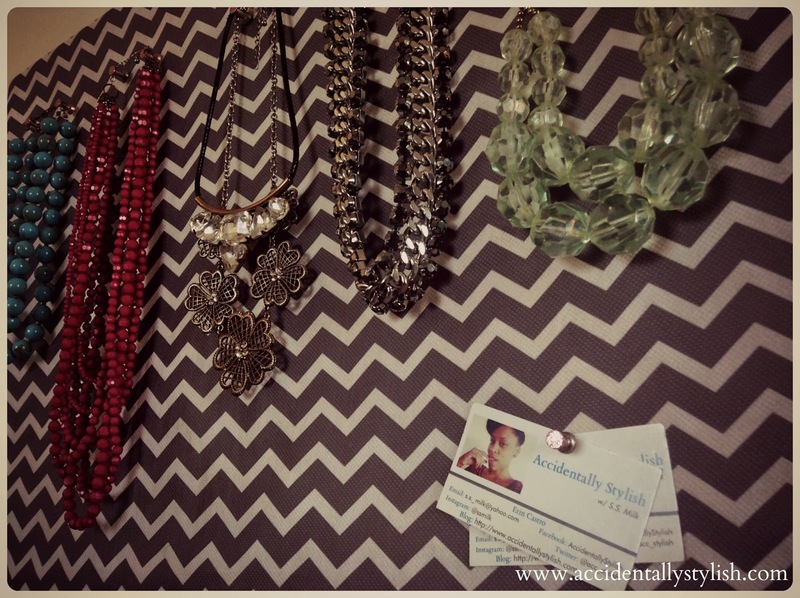 The necklaces pop against the fun chevron and it's a great way to add some color/texture to a rather blank wall. I'm happy with how the push pins turned out as well. The nail polish was just enough to add a bit of chic to the pins without taking away from the fabric or my favorite necklaces. So what do you think? 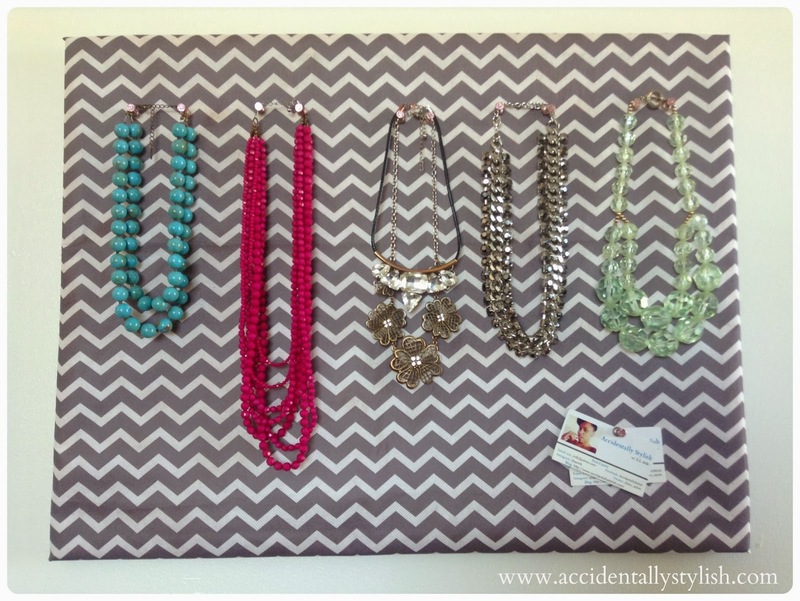 Are you going to give the good ol' jewelry display board a try? If you do choose to make one, share your great creation with me! 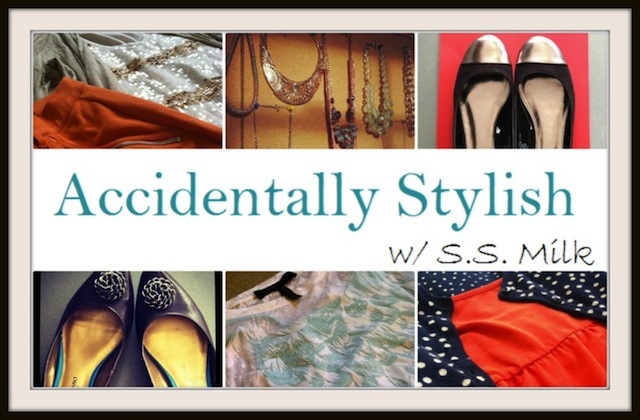 I'd love to see how you styled your chic masterpiece! Here's to all the DIYers out there and having a little fun revamping your looks! Such a cute project! I don't have any jewelry to display but I'm tempted to break out some polish and give the push pins in my office some razzle dazzel! This is a really great idea! cute.